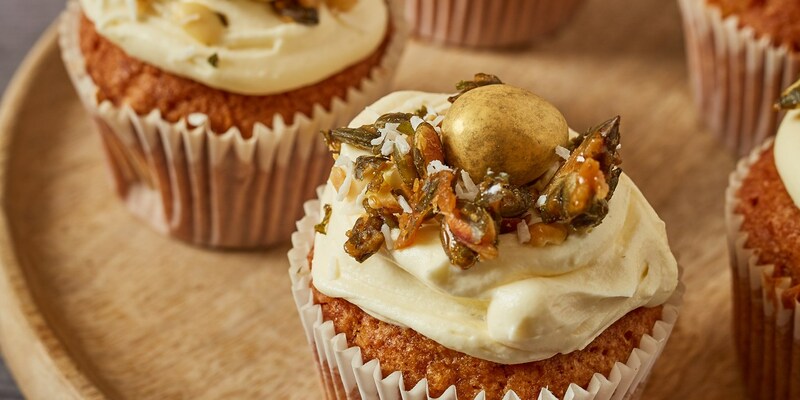 Looking for something new to bake over the Easter holidays? The Dusty Knuckle’s Miranda MacDonald has tweaked some of our favourite Easter bakes, switching regular wheat flour for ancient grains like rye, spelt and khorasan to bring extra flavour to the table. Easter has always been the perfect time of year to break out all your baking equipment. Every year we’re blessed with four days of freedom, to prove, knead, stir and eat to our hearts' content. Traditionally, the end of Lent signals the return of luxuries like eggs, sugar and flour, and what better to do with those three things than to bake? Whilst we’re on the subject of tradition, trace our Easter bakes back far enough and you’ll find that the flour people used in the past is far different to what we use today. 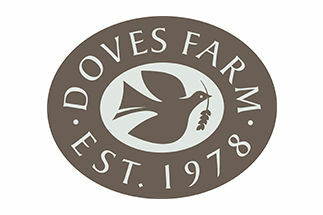 Modern all-purpose wheat flour is made specifically to be a jack of all trades, suitable for making breads, cakes, pastries and anything else in between. As such it also has a relatively neutral flavour profile. But in years past, bakers would have used flour made from ancient grains like spelt, khorasan and rye to make their breads and cakes. These ancient grains are not as forgiving as modern white flour – they don’t always have the same high gluten content and require a more careful hand when working – but they’re packed to the gunnels with flavour and are seriously rich in nutrients. The Dusty Knuckle is one of London’s best bakeries, with queues running out of the door every morning for its signature sourdough loaves and pastries. We teamed up resident baker Miranda MacDonald to tackle some Easter bakes that use ancient grains to their full potential. 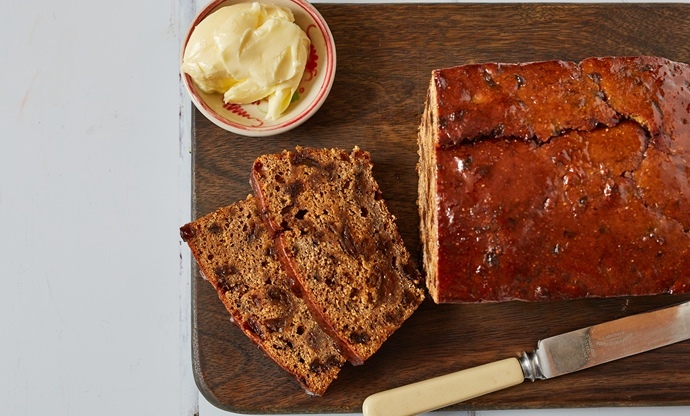 A slice of malt loaf slathered in salted butter is a quintessentially British treat, and whilst many of us grew up eating shop-bought malt loaf, you can easily make something just as delicious in your own kitchen. Miranda’s recipe is full of little delicious little details – using rye flour, for example, gives the loaf a lovely nuttiness, and soaking the raisins in tea adds a real aromatic depth that comes through in the final bake. You’ll find the mixture is very wet and dense – don’t worry, this is what it’s supposed to look like! The most important step of all comes after you have baked your loaf – wrap it in parchment and leave it for 2–3 days to mature, giving it that all-important sticky texture and a really rich flavour. If you’re looking for something the whole family will love, you can’t really go wrong with carrot cake – it’s a universal favourite. 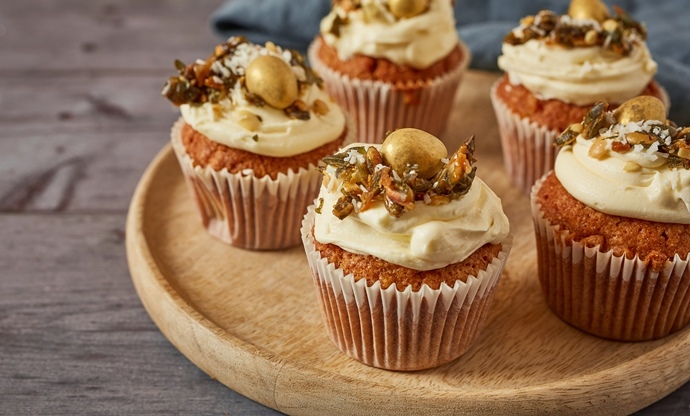 If there’s one criticism of the average carrot cake, it's that it can be a bit sickly, but sing a combination of spelt and wholemeal flour as the base of your cake batter gives these cupcakes an amazing depth of flavour. The crumb is rich and nutty with an earthiness that keeps the white chocolate ganache in check. They’re dead simple to make too – perfect for getting the kids involved over the Easter break. If there are two things every self-respecting Napolitan yearns for over the Easter break, it is pastiera – a cheesecake made with ricotta and wheat – and casatiello – a delicious Easter loaf made with all manner of cheeses, cured meats and vegetables. Casatiello is what Italians call a rustico – a rustic bread that is cooked with comfort and satiety in mind, rather than elegance. Miranda makes her dough using spelt flour for extra depth of flavour, then rolls it out and fills with leftover vegetables, cheese, before shaping in a cake tin. 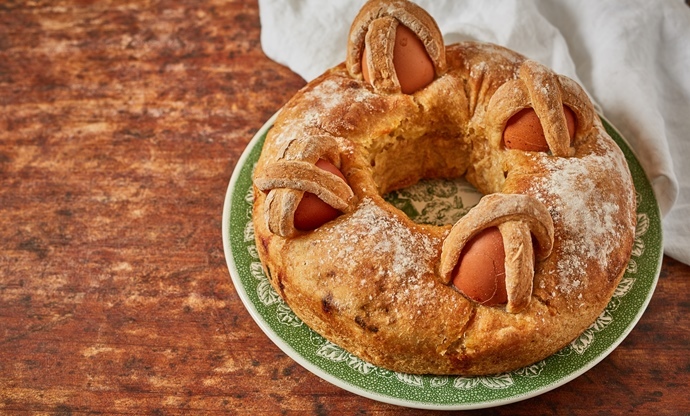 Finish by placing whole eggs on top of the loaf (a common custom across Europe) and securing with a cross of dough, representing the cross on which Jesus died. 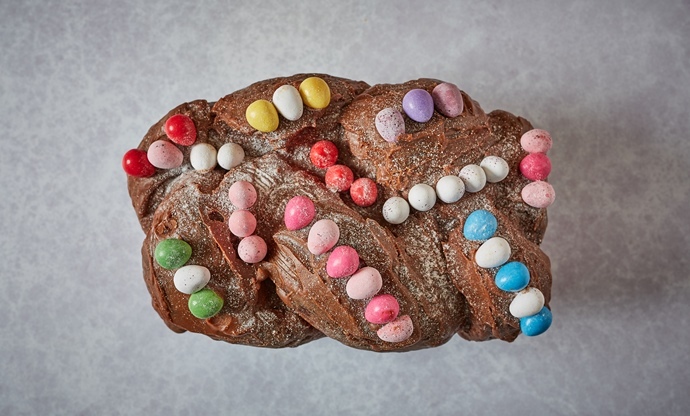 Decorated with a procession of multicoloured mini eggs, this chocolate rye brioche loaf is a fantastic way to get the kids involved in some baking this Easter holiday. Brioche can be a little laborious to make at times but Miranda’s recipe breaks things down to total simplicity, albeit with the help of a stand mixer. The key to great brioche is keeping your butter as cold as possible at all times, so it works nicely into the dough rather than leaking out during baking. You’ll want to set aside a day to make your brioche from start to finish (it’ll take two hours to rise and another two hours to prove) but the rewards are well worth it, and you can decorate the final loaf however you see fit. Rye flour is much lower in gluten than traditional wheat flour, which makes it perfect for making pastry. Whilst regular flour develops gluten naturally as you work it, rye flour does so far less, resulting in much shorter pastry. 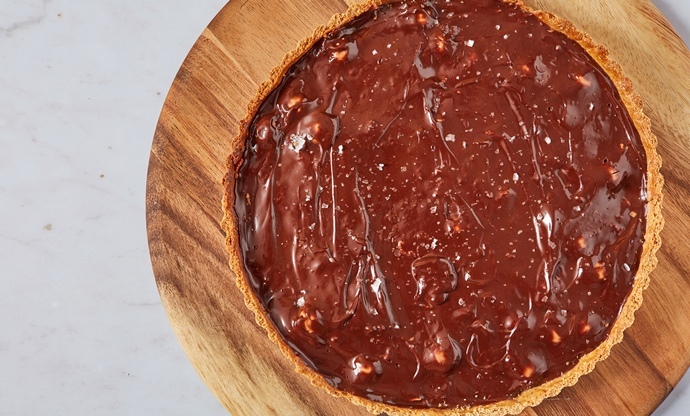 Miranda’s incredible salted chocolate and Malteser tart uses this to full effect – she bolsters the earthy flavour of rye with a biscuity brown butter, and leaves whole Maltesers dotted through the ganache to add little pops of crunch. A delicious crowd-pleaser. As the toasty foundation of eggs Benedict, English muffins are an essential part of our breakfast tradition. 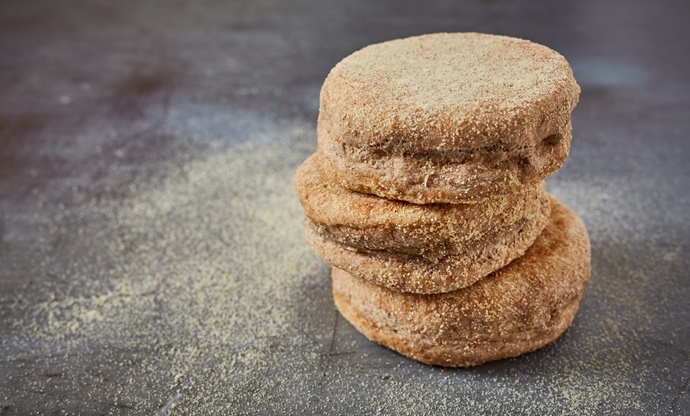 Miranda uses spelt rather than regular flour – evidence of spelt being grown and eaten in Europe and Asia dates back to 5000 BCE, and it has been commonly used in Europe ever since. These days spelt is valued for its deep, earthy flavour – Miranda lightens that slightly with a dash of honey, then kneads quickly to preserve the gluten structure and bakes for six minutes to make the perfect breakfast treat for Easter Sunday morning. Khorasan inherits its name from the ancient near-eastern region province where it originates – around modern day Iran and Afghanistan – but you may know it as Kamut if you’re a regular in British supermarkets. Though it looks much like modern wheat, it contains far more protein, amino acids, vitamins and minerals than its contemporary cousin, making it perfect for bread-making. 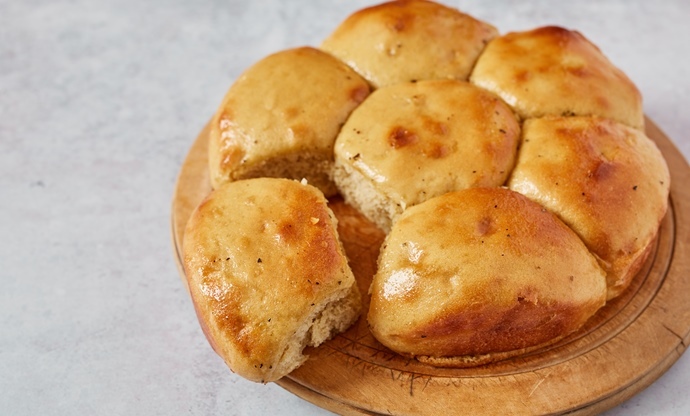 Flavour-wise, khorasan has a rich, nutty flavour and pleasant buttery texture to it – Miranda supercharges that by brushing her rolls with garlic butter before baking in the oven.